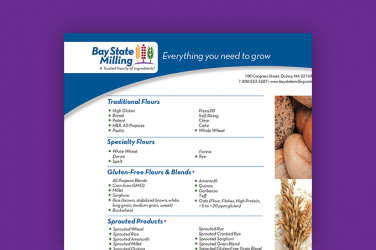 Bay State Milling Company offers an extensive portfolio of plant-based ingredients. This printable product list provides a quick-access look at our available ingredients. The company is steeped in more and 115 years of tradition as a wheat flour miller. Our offerings cover the gamete of flour applications with different protein and gluten levels to meet each customer’s application needs. Bay State Milling also holds a lengthy list of gluten-free and ancient grains. These products are generally offered whole, milled or in blends. Our portfolio of edible seeds can be purchased on their own or as inclusions with our other products. Through the BeneGrain brand, we offer the industry’s largest array of sprouted ingredients. BeneGrain Sprouted Ingredients began with organic and conventional sprouted wheat, but expanded in recent years to include several gluten-free and gluten-containing grains.